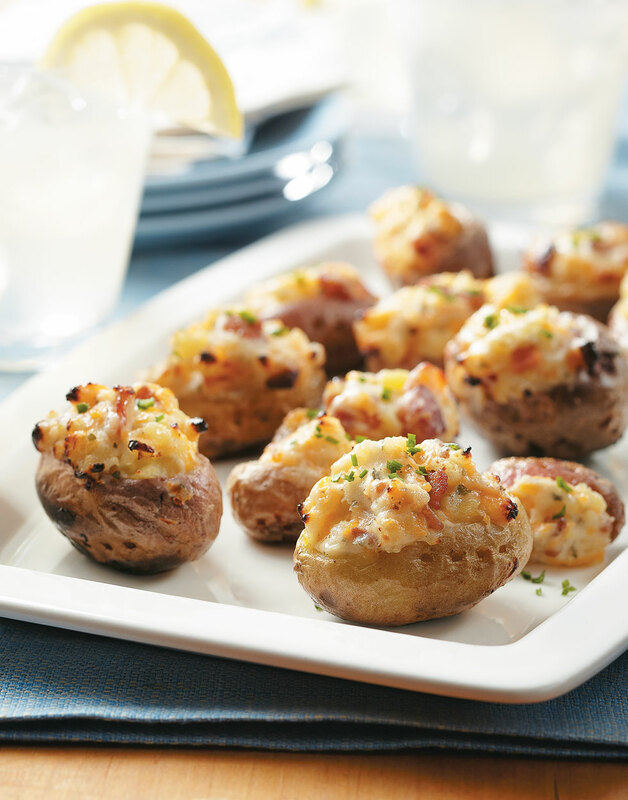 Twice-baked potatoes can take a long time to cook, but not these bite-sized poppers. Made with only a few basic ingredients, they’re an ideal option for last-minute guests or unexpected cravings. A microwave makes quick work of cooking these "twice baked" potatoes, which are then hollowed out, refilled, and grilled to crisp perfection. Pierce each potato multiple times with a fork or paring knife. Microwave potatoes until they give when squeezed, 8–10 minutes. Allow potatoes to cool until easily handled. Cook bacon in a sauté pan until crisp. Transfer bacon to a paper-towel-lined plate and reserve drippings. Slice off the top third of each potato. Scoop flesh from each potato with a teaspoon measure or melon baller, leaving about 1/8-inch flesh inside. Combine scooped out flesh with sour cream, ranch powder, Cheddar, and bacon; season with pepper. Brush the insides and skins of potatoes with reserved drippings. Scoop potato mixture back into potatoes. Grill potatoes until skins are crisp and Cheddar in filling melts. Sprinkle chives over potatoes. Piri-piri sauce is a hot sauce used in Portuguese and African cooking that delivers more than heat.